Sewing yourself a Dominique skirt? Vanessa here today to talk fabric choices with y'all! Dominique works well in a wide variety of fabrics. We've been compiling some Pinspiration to give you a sense of just how different it can look depending on what kind of material you choose - from chic black crepe to florals through solid colour cottons to a sparkly sparkly party time skirt! The straight version of the skirt is best suited to medium-weight woven fabric with a bit of structure to it. 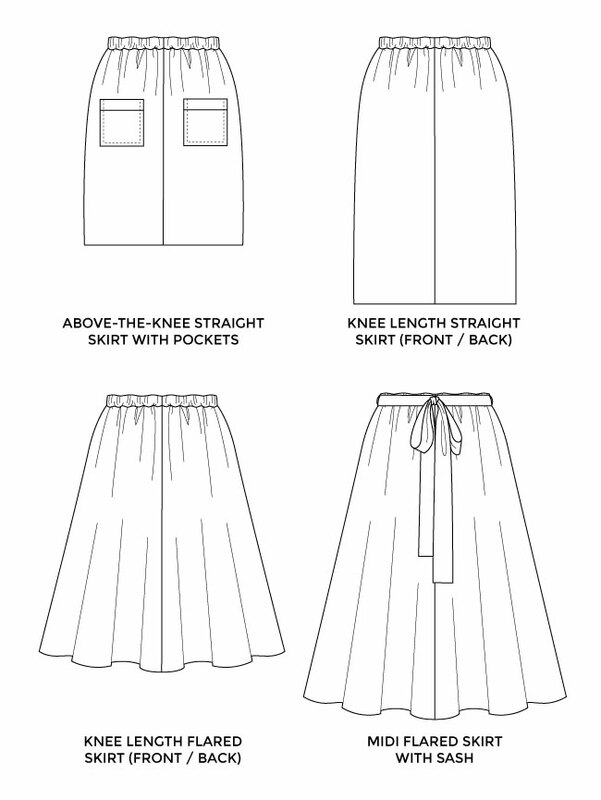 Fabrics such as chambray, double-gauze, linen, lightweight denim and needlecord will give the straight skirt a nice shape. They're also all relatively easy to wash, cut, sew and press – which is great if you're a beginner. You don't want anything too heavy - such as heavier denim or canvas - as they could make the elasticated waistline look a bit bulky. We used this beautiful anchor-print chambray courtesy of M is for Make. Is the flared skirt version the one for you? Then you’re looking for lighter-weight, drapey fabrics – something soft and slinky that makes you want to twirl around. The flared version is cut on the bias grain, which will give it a lovely flowing shape even in a lightweight cotton or chambray. A viscose (rayon), silk or polyester crepe de chine will make it look even more luxurious and feminine. Just be aware, if you're a beginner, that these fabrics can be a bit slippery - you can request a sample if you want to check before buying. We used this stunning coral crepe de chine, courtesy of Sew Over It. Just to note that whilst we think all of these fabrics look like great choices for the Dominique pattern, we haven’t handled them ourselves, so it might be an idea to order a sample just to make sure :) Take a look at the pattern details for how much fabric to buy and what other supplies you need. Happy fabric shopping one and all – as if you needed any encouragement ;) What fabric are you planning to use for your Dominique skirt? Can't wait to see! PS. Sign up to our online video workshop, Learn to Sew Skirts, for step-by-step tuition in making this skirt! Introducing the Dominique Sewing Pattern! Two New Online Sewing Workshops! Sewing Space Tours... Katie's Den of Zen!